Home Applications Updates Instant Translation with Worldictionary! Penpower.Inc presents a new essential travel tool geared up to give you translation just right on-the-go! The Worldictionary app instantly defines and translates words hassle-free with no need of manual typing or the fuss of taking pictures. The app is incredibly smart- by just pointing your camera to the unknown word, the app instantly displays its definition and translation. 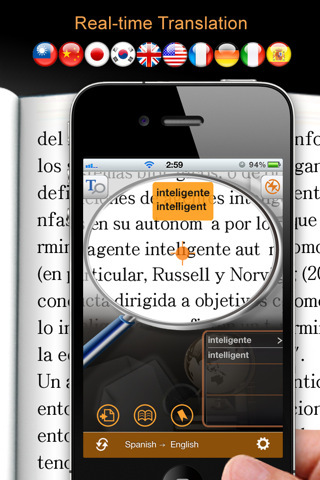 While testing, the app identified the word with an incredible ease, and has no problem of even providing the translation of two adjacent words! Note that the version also helps you to spell the words correctly in case of typing them, as it features prediction. The app features wide variety of carefully chosen languages to translate between, ranging from exotic ones such as Traditional Chinese to Danish, and Norwegian! By using "Advance Search" function, you can search through Google, Wikipedia and YouTube to enrich your information life anywhere, anytime. Worldictionary repeatedly saves your search records. You can even build your own word database to increase translation efficiency and be able to learn the words you searched. You can manually enter and translate any words as well, if no written version is available. Furthermore, app features anti-shake function to get better image quality. The app is available in the Apple App Store, to download it, click here.